For Harry Dresden, Chicago's only professional wizard, business, to put it mildly, stinks. So when the police bring him in to consult on a grisly double murder committed with black magic, Harry's seeing dollar signs. But where there's black magic, there's a black mage behind it. And now that mage knows Harry's name. Quick paced quick read. Fun goodness. With any luck Butcher will love and respect his protagonist more than Hamilton did! Probably the most cliche detective book I've ever read. I enjoyed it, and maybe one day I'll read the rest, but I think I'll also be okay if I don't. Was für ein Start! Ein Must-Read der Urban Fantasy. 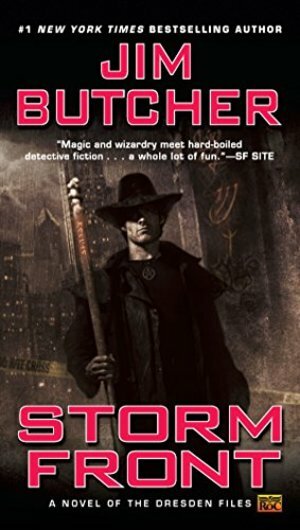 The first book in The Dresden Files is by no means perfect, but it is the beginning of an excellent series. If you are not hooked by the first book, but enjoy the premise and characters stick around. The books in the series just gets better and better as the writing, characters and stories develops nicely. I'd been advised by several friends to "give this series time." From disparate peer groups that do not interact, I'd heard "it gets better." If that's so, I'm looking forward to the next Dresden book all the more. Because, honestly, I thought this one was quite entertaining. It's true that the villain is obvious fairly early on. The naming of the NeverNever sounds a bit childish to me, and the whole soulgazing thing seems a bit awkward to me. Murphy seems somewhat thinly drawn at this point. However, these are likely just tiny smudges on a gem that will become more polished with each successive novel in the series. These books have a lot of personality, and I appreciated the way Butcher sketched out the details of Harry's world. He could've left out a lot of atmospheric details, assuming that most readers have some sense of what Chicago looks like, but I'm glad he didn't: his language makes it Harry's Chicago, and cocoons readers in the wonderful, gauzy rain of a genre that's new to me: magical noir. I appreciate the sense of humor and warmth that pervaded Storm Front, and I look forward to getting to know Harry, Murphy, Bob, the White Council, and Dresden's Chicago even better as I progress through the series.